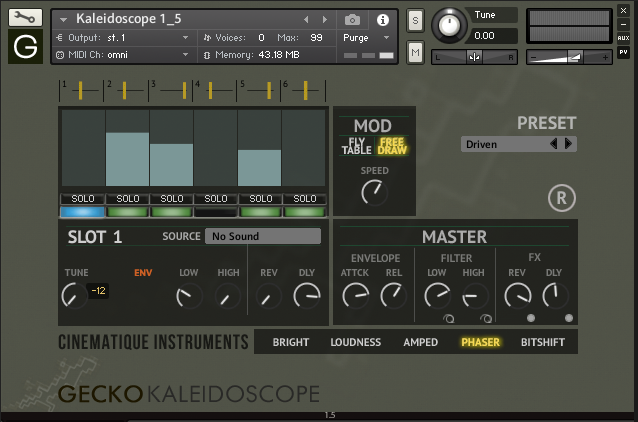 Gecko Kaleidsoscope runs under a newer Gecko version: Now, each slot is equipped with a separate high-, lowpassfilter, pitch, reverb and delay knob and som further features, please see at update history. - a fx area with noise, hizz, crackle and field recording. 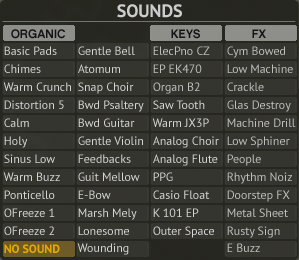 All this improvements raised the amount of presets up to 54. Gecko Kaleidoscope is a wonderful tool for big and deep motion pads and background ambients. It covers a wide range, from bright electronic ambients to spheric string textures, over deep background pads to fx sounds. All these sounds will be useful and inspiring for your work. They will fit into many styles of music and will give your piece of music a special kind of depth and richness!